What is a VLF observatory? It is a VLF receiving station with one or more VLF receivers always running. In this radio station, unlike a classic amateur radio station, received data is saved. 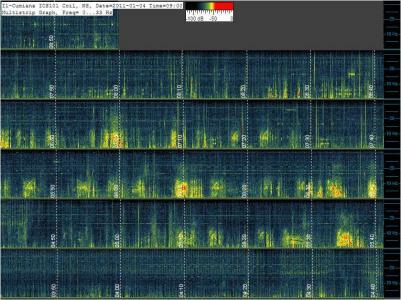 The spectrograms with their plottings and signal levels, and the signals themselves are stored to be available on our PC for consultation, even several years later. A monitoring station that can have scientific functions: such as the study of VLF radio signals correlated with earthquakes. Difficult to activate? ...maybe less than you think. - a little dedication: The system works by itself but requires maintenance. To monitor and measure VLF first we need a good signal: it may seem trivial, but you have to start here. 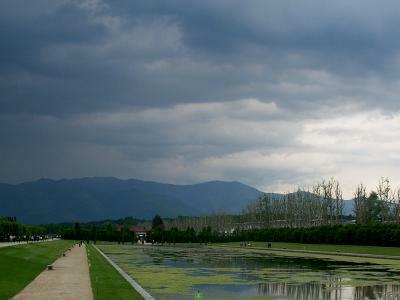 You need to find a quiet place, away from industrial noise and away from power lines. 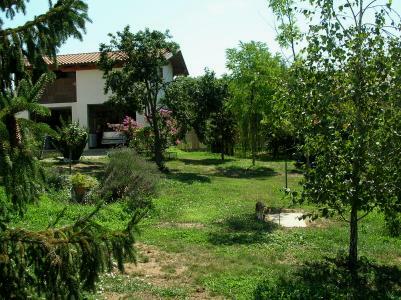 A desert would be the ideal location, but a cottage in the countryside with a garden around it can often be the real answer. We know that the signal of "natural radio" is very weak. In our townhouse it is present but is completely covered by the AC hum coming from the power supply lines. Each appliance in our house is a powerful source of VLF signals and thus an obstacle to receiving those from Nature. A switching power supply, neon bulb lamp, television, computers and even solar panels, with their power control devices (the charge regulator), are an obstacle to good reception. A quiet corner in my garden, good for VLF reception, and a piece of urban area in Turin, ...not good for a VLF observatory. One could write many words about it. The reception of radio signals of natural origin has several approaches. You can monitor the signals in a broad spectrum, from a few hundred Hz to 20 kHz. Or you can put the focus on lower frequencies, ELF and ULF bands, where there are natural radio signals such as the Schumann resonances and also military signals that are directed to submarines. We can also attach a geophone and have with the radio landscape also the acoustic signal situation: this may help in the study of seismic-precursor signals. Some receivers presented on this website, and other commercial solutions. Starting from left/top: Floating Solar Receiver, Easy Loop, geophone sensors, B3CKS antenna, ICS101 induction coil, Explorer E202. 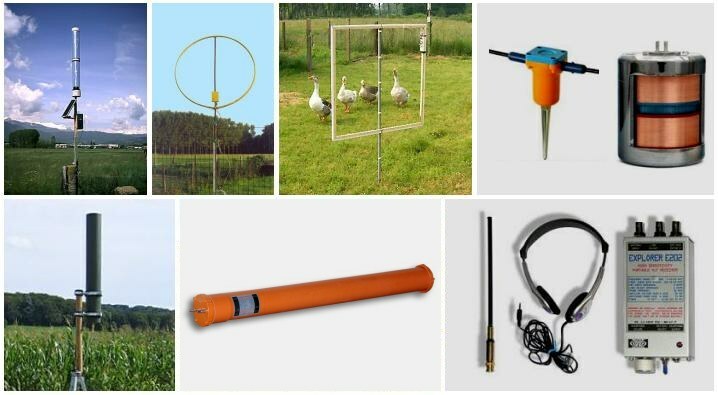 You can find many projects for receiver construction on this site. See the home page www.vlf.it . To start with this project the first thing to do is to have a portable receiver. With it you can explore the area around your property looking for an electrically quiet location. ...and many times here the trouble starts. We found in our garden, in a corner not too close to home, a suitable place. But as soon as we connect the receiver cable to the PC in the house the quiet place becomes noisy: the natural radio signals are replaced with strong hum noise! What happened? By connecting the receiver to the PC we directly convey the hum noise to the receiver: it is a problem because we have installed the receiver outside just to escape from the hum noise inside. The same thing happens when you try to power your receiver with the AC Mains instead of a battery. If you are using an electric field receiver there are only three possible solutions to this problem. -Electrically: to isolate the signal line with an audio transformer and power the receiver with a battery. The battery can be kept charged with a small solar panel with simple modification. -Use an antenna larger than the simple stylus: it increases the strength of natural radio signals received while the HUM noise level remains almost constant. The result is that the S / N ratio improves. For my Cumiana Monitoring station I chose this second solution, with a big Marconi antenna. -Replace the electric field receiver with a magnetic field receiver: for example the EasyLoop (http://www.vlf.it/easyloop/_easyloop.htm ). This kind of receiver is less sensitive than the first one to conducted hum noise. But the magnetic field receiver is affected by all the stray magnetic fields of transformers and motors around the house and property: in any location the signal coming out of an EasyLoop can be much worse than the one received with the electric field receiver. The situation should be evaluated carefully. We must do many tests and every place has its own characteristics that distinguish it from others. It's impossible to tell if a site is suitable for VLF reception without doing some testing first. The computer should not be old. If you intend to put data online a machine manufactured after 2005 may be new enough. Many processes must be run simultaneously and require a large HD to store the data: at least a 250 GB HD, 1 GB of RAM and 1.6 GHz clock speed or higher. These are the minimum requirements. You will also need one or more sound cards depending on how many receivers you want to put on line. The basic sound cards are good (Creative, Yamaha ...): we don’t need special effects like Dolby Surround, 3D sound etc. Even a single sound card or a good quality USB external card is fine. But if you use more than one sound card use PCI only. It is because the electrical ground for the USB card is different from that used by the PCI sound card. In the same system the two methods are exposed to noise generated by the PC, especially if they are connected together. A used assembled PC and a new UPS are sometimes the cheapest solution. How big should the UPS be? UPS? We need a UPS? Unfortunately, yes. It can be very small, a few hundred watts. With only a few tens of €/$ we can solve the problem. But it is essential. To keep the monitoring station on-line your PC will run many applications. These can be loaded automatically, but several (like SpectrumLab) can fail to start automatically. This is especially true if there are many files of a single active SpectrumLab session. It means that even a brief power failure can sabotage the system: in most cases it will not be able to restart itself and you have to restore it manually. This should be avoided. A UPS also helps protect your PC from external surges. This is a sad topic. Receiving stations located in the countryside are at very high risk of lightning. It is because the power lines in the country are usually above ground. It exposes them directly to the risk of being struck by lightning. In addition, they can function as an antenna: even if the lightning does not fall on the line directly, during a thunderstorm the end user can be subjected to voltage surges over 1000 Volts. 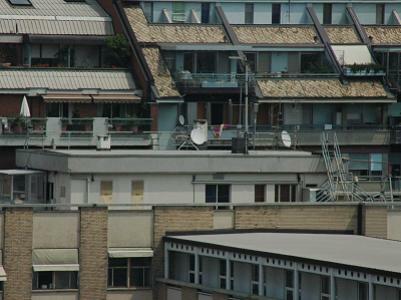 But at the same time, the stations in the city which are less at risk are less suitable to listening to natural radio signals because they are submerged in the hum noise. The direct consequence is that usually a good location is very risky. Despite all these protections you need to be ready for the worst. In 10 years as a monitoring station OpenLab burned: 3 Computers, 6 Audio Cards, 2 Modems, 2 Routers and many other devices such as electric line protection, stabilized power supplies and various receivers that I repaired by myself. These words are not to discourage those who would start, but only to avoid unpleasant surprises when the first storm comes. It is very rare, but it does happen sometimes. 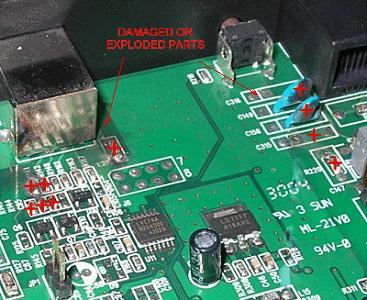 Before and after the storm: some components of my router are damaged or exploded. The lightning entered by telephone line. Well, now that all the hardware is ready we can move on to the software and start programming. This is the king of programs for real-time analysis of audio signals. It is free and can be downloaded directly from the web site author: Wolfgang Buscher http://www.qsl.net/dl4yhf/spectra1.html . This software allows us to process spectrograms, to plot signal levels, to record audio files and to create an archive of the activity. Let's see how. We can simultaneously open several sessions of Spectrum Lab and in each session choose which sound card to use. This means we can make different calculations on the signals, using a single sound card. And it also means that we can have on a single computer multiple sound cards (such as 3) and have running many Spectrum Lab sessions (for example 8). The things we can do with a PC, sound cards and SpectrumLab are nearly endless! Left picture shows the VLF activity at Pontese Observatory, with electric field on top and magnetic field on bottom. Right picture shows the ELF/ULF activity at Cumiana Observatory, with acoustic geophone signal on top and electric field on bottom. An 800 pixel base size picture shows the last 8 hours activity: it is useful to see if there are long-term changes present in the signal. The choice of color palette is important, especially if there is more than one monitoring system in operation. In the “VLF Openlab Observatories" network we use green for the magnetic field, blue for the electric field and purple for sounds coming from the geophone. In this way, the signals become more easily recognizable, especially if you run two or more receivers with multiple sessions. The previous representation is not able to detect signals that have a faster evolution. So then the multistrip representation helps us grab the fast signals. Also we can save space in the spectrogram representation; Using multistrips is both faster and smaller. Left picture shows the signal coming from an induction coil for ULF observing, placed in Cumiana Observatory. Right picture shows the VLF activity at Pontese Observatory, with electric field on top and magnetic field on bottom (as before). The plotting shows the trend of signal levels at different times. It is considered a very important method of representation especially for researchers in the field of seismic activity. It represents how the signals would be viewed on paper like on an old plotter. It is certainly important if coupled with spectrograms. Here below are examples with 4 traces. Three traces show signal levels: two coming from antennas and one coming from the geophone. A fourth trace (the yellow one) has been used to monitor the frequency of a signal here which in this case is the second Schumann resonance. The scroll time is 150 seconds for step and the window shows the last 32 hours activity. Spectrum Lab has a rich set of commands for the plottings. They are in the instructions, see “Interpreter commands”. Here this fourth frequency function has not been obtained with the simple command interpreter of Spectrum Lab. It was edited as a macro (read “Wolfgang Buscher edited a macro for me”), to obtain a smoothed trace: here are the details. Macros are a great resource for this software. It performs thousands of functions alone, but if we want a special feature we can program it. "I1-Cumiana, Date="+str("YYYY-MM-DD",now)+" Time="+str("hh:mm",now)+" (Geophone/E-field)) "
"Freq= "+str("###0.#",water.f_min)+"..."+str("###0.#",water.f_max)+" Hz and 0...105 Hz, provided by www.vlf.it "
In this way, automatically, every 4 hours, the spectrogram and plotting pictures are saved, with complete data hour and name. Your archive will soon become large and contain many files. Even so it will be easy to find the right file thanks to the name that identifies them. In the study of low-frequency signals it can be useful to re-analyze the signal a second time. This is not possible if you have not saved a wave file. Spectrum Lab allows this operation. Obviously, this makes sense if the saved file has a low sampling rate and bandwidth. If you save the entire range of the sound card it will occupy much disk space, so your HD will be full within days. It is therefore appropriate to set the decimation of saving to only a part of the acquired band. Activate in the Wave files Save Options the “decimate saved audio sample” option, and set a proper value of samples/sec. 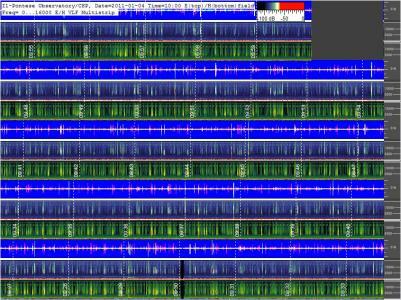 Here we set about 250 Sample/sec: the saved bandwidth will be 0 to 125 Hz. This can be very useful for ELF and ULF post processing signals. In the same way as before we can put the proper command in the “periodic actions” to save the decimated audio file. With the “wave.record” function we do the same thing we did with the jpg file above. Every 4 hours we close the old wave file, save it with the date and time, and open a new wave file. You need to set the time server address (time.ien.it in the example): (there are many time servers on the web) Then you enter the protocol type, the port number and the time interval to operate the synchronization. I think 3600 seconds (1 hour) is a good compromise, but you can also choose a shorter time. 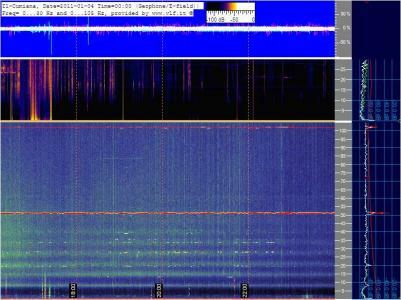 Now our VLF monitoring station is active. 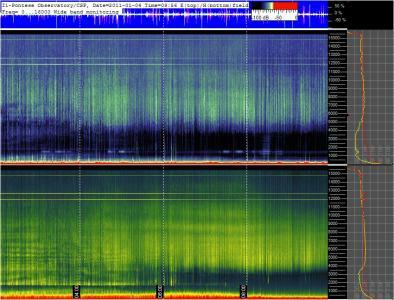 In a short time we have a lot of archived files with spectrograms of interesting signals. We can also go away from home a few days and when we return we find all our files updated. If there happened to be an earthquake, or there was a solar storm, we can open our Archive and look before, during and after the event to discover what interesting data our station has recorded. Now you are wondering if it’s a difficult thing to put your data on-line; Not at all. But that’s another story. Wolfgang Buscher, author of SpectrumLab for the continuous support.